It is estimated that by 2016, more than half of the world’s wealth will be owned by the top 1%. Is it bad? Depends on if you’re in that 1% or not *cough* Kritika *cough*. For the other 99%, it’s pretty unfair that the hardwork put in isn’t rewarded with fat paychecks, giving the rich more power and leaving the rest with voiceless and uncared for. More detail can be drawn from the (poorly copied – couldn’t do much about that sorry) figures. The figures have % share of global wealth on the vertical axis, and the years as shown on the horizontal one. 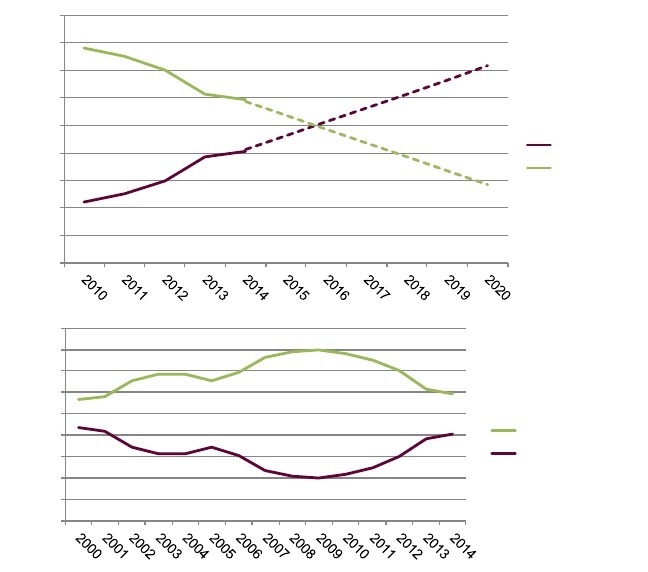 The top figure (to be referred to as figure 1) shows the projected changes in inequality (the black line represents the top 1% in both figures). The bottom figure (2) shows how the distribution of wealth has changed over the past recent years. What’s interesting to see is that inequality was generally falling up until The Great Recession. Why? One possible reason could be through derived demand theory (world demand was falling, so this has a knock-on effect to labour). This impacted severely on households (not only did the income streams stop, but companies weren’t looking to hire). Workers had to be willing to accept lower wages in order to find a job (to pay bills), or, as most did, sacrifice your own home. So as a result disposable income, and thus income available to be invested in ways of increasing one’s wealth, fell. In contrast, the 1% flourished during this time (see my other article on hedge fund managers earning $1 billion+ in 2009). The tax reforms by governments didn’t help – in the UK and US taxes on the richest 1% actually fell, pushing them further away from the rest. Other reasons include exploitation of monopsony power over labour in 3rd world countries, monetary policy, inflation, poor tax policies etc. Whilst these policies look fair, they have major set-backs. E.g. tighter regulation on transfer pricing or changing the tax policies may see brain drains from countries. Minimum wages will reduce demand for labour. What if people getting these minimum income guarantees waste them? How can we be sure that legislation on equal pay and giving women a fair deal will implemented effectively? What about rising government debts – shouldn’t governments be cutting spending and adopting austerity measures first, before pursuing other objectives? There are some major opportunity costs here – on one hand we can try and reduce inequality in the short-run, but it will come at a cost in the long-run as governments hit debt ceilings. If we adopt austerity measures in the short-run, it is likely that inequality will worsen, until debts are paid off. Europe’s economic woes don’t seem to be abating, but in comparison to Greece’s they appear trivial. Since the Great Recession over 200 000 thousand Greeks have left for North America or other countries within Europe and it does not appear to be stopping. The implications for the Greek economy are worrying and we can apply some useful diagrams to aid our analysis. Obviously the long term unemployment here is a good starting point. Unemployment is over 50% and unemployment hysteresis postulates that a temporary shock to aggregate demand (AD) can permanently lower the potential output of the economy and increase the equilibrium level of unemployment. The diagram below shows that higher unemployment and reduced incomes results in an inward shift of AD but the structural unemployment, evident here, results in an inward shift of the LRAS. For ease of explanation we can use the PPF diagram to help illustrate the effects of the above as well as the impact of a significant exodus of human capital from the Greek economy. Out of the frying pan… And into the fire! This isn’t just limited to the UK government of course. This situation extends to the private sector, where people have been taking advantage of ultra-low interest rates (debt has fallen slowly in the UK, but it is rising rapidly in the Far East. The trend over there is that risky borrowing is reaching unsustainable levels – another de ja vu), and the Eurozone, which is on the brink of a triple-dip recession. (Fun fact: global debt rose from 180% of total GDP in 2008 to 212% last year). Now although the UK economy IS growing, we can argue that it’s not growing fast enough (it’s growth rate fell to 0.7% in Q4 of 2013, down from 0.8% from Q3). For the private sector, the only way to deter risky borrowing is to raise interest rates, however this may damage the prospects of a healthy recovery in the short-term. For the public sector – they need some more revenue through taxes and profits from corporations they own. So now we are left with a dilemma – should we make an effort to curb debt in the short-term, which will damage the recovery in the short-term, or keep the ball rolling and see what happens in the long-term? One thing is for sure, Rising debts + slow growth = another crisis. China – the economy practically holding the world together, has seen a significant deceleration in growth over the past few years. So there is no guarantee this recovery will work out in the short-term with current policies anyway. It seems pretty clear that in an attempt to save their respective economies, Governments have probably made a bad situation even worse. With governments closing in on bankruptcy because of their net debt, who will be there if the big banks were to fail again? This article is something I read precisely 1 and a half years ago – it’s regularly updated and has some scary yet interesting information about the UK economy (whilst also trying to sell you their service). A world without OPEC and a halt to global warming? The recent drop in oil prices lends itself to fascinating analysis. OPEC members are finding it difficult to agree on a strategy to increase price and are more inclined to ‘cheat’ and sell more for less to protect revenues and market share. High expenditure projects in Venezuela and some Middle Eastern countries have placed greater emphasis on generating revenues to balance the books and, with the falling price of oil, they are perilously close to fiscal deficits. As an aside one of the articles below questions the motives for such spending and thus begs the question as to what may occur when such spending ceases? The increase in US shale oil appears to exacerbate the situation further as supply is outstripping demand and on the face of it would signal the beginning of the end of OPEC. Combined with the latest UN backed report stating that the use of fossil fuels should be fazed out by the end of this century if irreversible damage to the planet is to be avoided, countries like Kuwait need to restructure their economies sooner rather than later. Great opportunity for development of chains of analysis and evaluation with diagrams. By obsessing over that which we aren’t any good at, are we operating inside our individual PPFs? Or is our obsession beneficial in that it promotes an increase in productivity in that activity? I know, the relevance to economics appears a bit far-fetched… But the article is brilliant! Would you buy an Huawei? The potential answers to the above question, once explained are revealing. Why would you prefer an Apple or Samsung phone or are you more cost sensitive? Huawei has successfully broken into the oligopolist smart phone market based on a low price strategy. But it is not just phones that Huawei produce: a third of the population of the world indirectly use an Huawei product. But just as a strong brand acts as a barrier to entry, can a country ‘brand’ prevent a company developing a strong brand identity? China has long been associated with low cost and poor quality products. If money was not an issue would you really buy a Huawei phone? Innovation in processes and products can lead to significant average cost reductions leading to increased competitiveness and market share. Chinese firms are now the third largest owners of patents behind the US and Japan. Has China unleashed ‘the gales of creative destruction’? Below is a podcast from the BBC’s Business Daily that explores the change occurring in China with its focus on Huawei. Plenty of chances to practise your chains of analysis and diagrams. Economic growth is the increase in the total production of goods and services within an economy (real GDP), and China seems to know all about it. In 2013, it produced “$9.5 trillion worth of goods and services, nearly 3 times more than that of 2007”. But how significant is this growth? This type of growth cannot survive in the long run, especially in a world where factors of production are becoming more scare. For example, would countries during the mid-twentieth century really have cared about how efficiently they were using oil after major deposits had been discovered in the Middle East? Probably not, since they would be aiming to extract as much oil as possible versus efficiently employing the oil. However, today, firms are trying to utilize oil (and its products) more efficiently due to its increasing scarcity. Essentially, “in the long run, improving the productivity with which they (factors of production) are used is the magic ingredient for any economy, the only path to sustainable growth.” Moreover, this growth may not necessarily reflect an increase in living standards. If GDP grows at the same rate as employment, real wage rates (or income per capita) may not necessarily also grow. Hence the concerns about China. 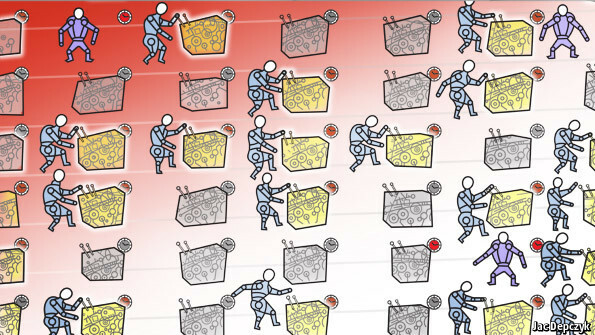 A series of estimates published this year have all suggested that productivity is flagging. This may be even more detrimental to China’s future, as it could be signalling an end to it’s “catching up” rates of growth. “Catching up” is a phenomenon which allows countries like China to grow by 10% oer annum whilst the UK barely manages 1%. By transferring workers from low productivity sectors (eg. agriculture) to higher productivity manufacturing and service sectors, economic growth will substantially increase as the value of goods being produced per worker is greater. If a worker can produce $500 per year in output as a farmer, but $1000 working in a factory, then the act of transferring that worker from agriculture to industry will raise the growth of the economy tremendously. If China is entering a stage in its economic life where productivity cannot increase by transferring workers anymore, it could finally expose inefficiencies within the economy. Why is falling productivity harmful to China’s economy? What limitations are there to measuring total factor productivity (TFP)? How does the “catching up” phenomenon distort the TFP figures, if at all? What could this suggest will happen to China’s economy in the future? What can China do to improve its productivity?